The recent piece on Reality Sandwich by author and researcher Richard Merrick called "Building a Religion" speaks to the promise that simple geometry has to provide a new view for reality. 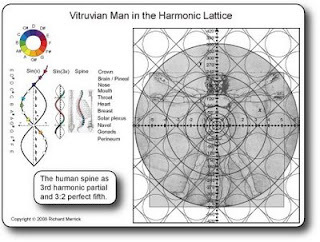 The geometry he speaks to is known as "sacred geometry" by many, Richard refers to it as "harmonic science" with references to Newton, Da Vinci, Pythagoras. The article is a must read - as he speaks of the history of harmonic science in science and religion over the centuries and to the potential that it holds to transform our relationship with our Cosmos. "But if the study of harmonic science ever were allowed back into the educational system, we might expect a cultural Renaissance that would make even Leonardo’s naked Vitruvian Man blush. T-shirts would implore us to “Bring back the aether” while religious bumper stickers proclaim, “Get in touch with your inner archetype!” The full intersecting circles of the Vescia Piscis would suddenly appear in place of just the fish part on all those Suburbans. Even Einstein’s “everything is relative” would sound tired, replaced instead by Pythagoras’ “everything is proportional.” Fashion would explode with “sacred geometry” and Egyptian styles could make a comeback. The idea that an archetypal structure in space actually shapes flowers, insects, fish, birds, pets and people would be irresistible and, I think, difficult to suppress once the meme was released." Very true words. I am an artist and teacher whom has recently found the patterns in ancient art of all nations. I am inspired by the music of the spheres. It does my heart good to find others.